Packaging and storage: flexibility at any level. An important aspect for you is our flexibility in the field of packaging. To meet your wishes, we have an entire team at our disposal to package all products in accordance with your specific needs. 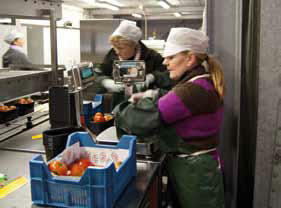 A total of at least 30 staff members are engaged in packaging all kinds of fruit and vegetables on a daily basis. Specific orders can be delivered to the final destination in no time. Leek, lettuce and tomatoes can be easily packaged under the customer’s label and barcodes. Thinking along with the customer is very important in this context. Each customer has their own needs and we try to meet these needs to the largest possible extent. In its warehouse in Ardooie, Demargro has 6 separate cold stores with a total surface area of 3,000 m². These cold stores enable us to store all goods at the right temperature conditions. The total storage capacity amounts to 8000 m². 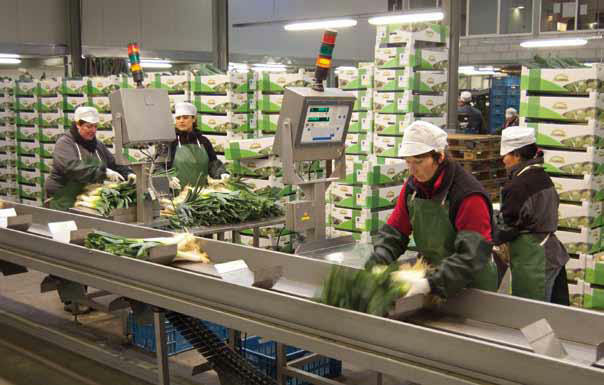 Demargro guarantees that its products, fruit and vegetables are of the highest quality. Demargro is the leading specialist in Flandria products. At every auction we have a well-trained quality officer who monitors the quality of the products supplied. Thanks to an advanced traceability system we can guarantee our customers full “traceability”. This enables us to map the entire “route” of a product from the moment it is sown to the moment we deliver to you. Demargro meets the highest standards in the field of transport, storage and packaging. Demargro operates under an HACCP system. This enables us to guarantee the food safety of our product. Our goal is maximum customer satisfaction.